It goes without saying that war and conflict affect both men and women’s human rights. However, there are particular gendered dimensions to violence that have a disproportionate and differing impact on women. You can also read a great explanation of Women, Peace and Security is here. Though women have been, and are, active agents in peace and reconciliation efforts at all levels, women and gender analysis are regularly excluded from peace-making processes and decisions. WILPF believes that the exclusion of women, women’s rights and gender remains a key impediment to the attainment of sustainable peace and human security, and must not be ignored! 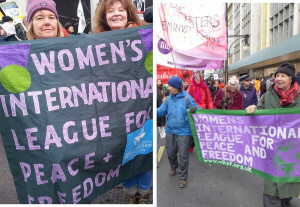 In 2000, WILPF created the PeaceWomen Programme (peacewomen.org) to ensure that women’s rights and participation are not disregarded in international peace and security efforts. The PeaceWomen Programme monitors, informs and advocates for women’s rights and participation in conflict situations and promotes gender analysis in conflict prevention. PeaceWomen focuses on the United Nation’s “Women, Peace and Security” agenda that includes implementation of the UN Security Council’s Resolutions (SCR) 1325, 1820, 1888, 1889 and 1960. You can read GAP’s written submission for UK’s 2014-2017 UNSCR 1325 NAP here, as well as the UK Government’s full report here. The LSE Centre for Women, Peace and Security is also a great resource, they often put on talks and events, find out what’s going on here. WILPF and Voices of African Women (VoAW) completed a series of three successful events highlighting the situation for women, peace and security in the D.R. Congo. They were hosted by senior academics at SOAS and LSE, London University, and in Parliament hosted by the All Party Parliamentary Group (APPG) for Africa, (Vice Chair, Anne McLaughlin, SNP). The panel of speakers included Congolese eye-witness WILPF members, Kongosi Mussanzi and Furaha Mussanzi, Eve Bazaiba, MP, a woman Congolese parliamentarian, Sophia Pickles from the NGO Global Witness and Catherine Plugers representing the UNA. The packed APPG included about ten MPs, some of whom stayed to discuss issues with the speakers and audience members afterwards. Marie-Claire Faray worked tirelessly to set up these events. She brought Eve Bazaiba from the D.R. Congo to speak in Parliament and to met with UK parliamentarians to share her insights on the political situation in D.R.Congo. Marie-Claire wrote a background paper on how the UK can support the participation of women and Rule of Law in D.R Congo. Read the report here. As a result, Marie-Claire has been invited by the Parliamentary International Development Select Committee to provide oral testimonies on the situation for women in the D.R. Congo, and is travelling in Congo to collect them. These events have been very important in raising awareness of the situation in D.R. Congo, and WILPF’s work and relevance in raising this issue. If you want to know more about women, security and the D.R Congo read the River of Gold report and the WILPF report on Women in Artisanal Mines in DRC.